What do glow-in-the-dark pop-up children's books, eco-friendly mobility vehicles, electric auto rickshaws, a memory aid device for Alzheimer's patients, a home budget application for mobile phones and upscale travel luggage for working women have in common? 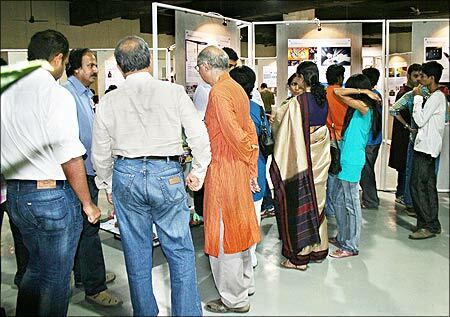 But all of these products and more were on display this weekend at the Nehru Centre in Mumbai, where the Industrial Design Centre at IIT Bombay held its Annual Design Degree Student Exhibitions. 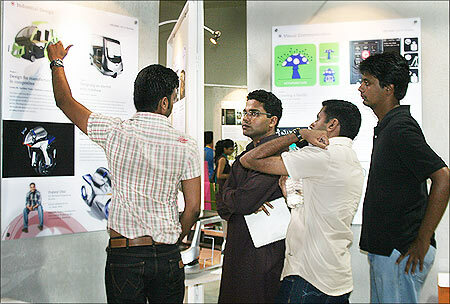 The school's two-year Masters in Design programme culminates in the exhibitions, when students have a chance to show off the fruit of their labour to fellow academics, general public and business leaders. The 47 students graduating this year were each required to complete three projects, which they collectively presented in a gallery style exhibition. The projects were impressively diverse and varied, from tackling issues of transportation and ergonomic design, to addressing issues of lifestyle, and everything in between. There were gadgets, games and gizmos galore, each one unique and interesting. While some students sought to take up issues of public concern -- water sustainability, for instance -- others dealt with more personal topics, like identity. The IDC at IIT Bombay receives thousands of applications each year, but a rigorous screening process leaves standing only the top 50 or so, usually toppers from Bachelor of Arts, Bachelor of Engineering and Bachelor of Architecture programmes. Because the two-year programme encourages summer internships and link-ups with established design companies, most students are already well-versed with the business side of design by the time they receive their degree. It's no surprise, then, that the graduates go on to achieve great things. This year, although many of the graduating students plan to pursue further studies (IDC has a PhD in Design programme) or take their skills to MNCs and other established companies, the head of the IDC Department, Professor G G Ray, says that he expects the bulk of his graduating students to flex their entrepreneurial muscle. "I think a lot of them will pursue start-ups. They have the intelligence, creativity, motivation and courage to try their hand at something new. Those are traits we try to nurture at IDC." This year was particularly rewarding for IIT - IDC faculty and students, as it represents the programme's 40th year of existence. IDC was set up in 1969 by the Government of India under the auspices of Indian Institute of Technology Bombay. "Though both design and art utilise creativity, a major difference between the two is that design uses creativity to tap into society's needs gaps, into the needs of people. With design, there has to be functional intent. At IDC, we take that responsibility very seriously," said Dr Ajanta Sen, a PhD holder from IIT - Bombay and one of the IDC programme advisors. With three projects per student, and 47 students in total, 141 projects were on display. "This project aims at designing a vehicle which can carry two adults. This vehicle runs on an eco-friendly energy platform," says Amey Dhuri, an Industrial Design student, who had earlier earned his BE in Automobile Engineering. Amey, whose interests are transportation design, product design and auto styling, adds that, "The targetted user group is office-goers who will use this car in city limits. The vehicle is designed to park in the least possible time and it is highly manoeuvrable in city traffic." Prajwal Ullal, an Industrial Design student who earlier earned his BE in Mechanical Engineering, also tried his hand at transportation design, with this eco-friendly electric auto rickshaw. "The auto rickshaw is one of the most commonly used modes of public transport in India. Due to its compact dimensions and higher manoeuvrability it is a preferred mode of transport in congested cities and suburbs," he says. But unlike the vast majority of rickshaws, which use compressed natural gas and thus are noisy and heavy polluters, Prajwal's rickshaw is electric. 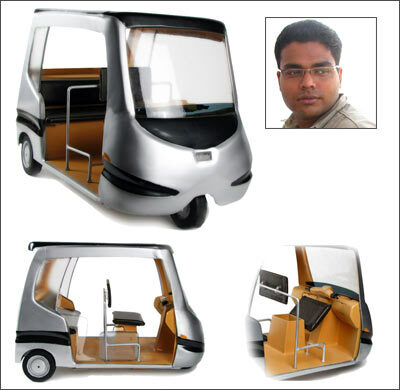 "The project work dealt with redesigning the current auto rickshaw for a better and efficient working and also to provide better comfort to the passenger and the driver also, increasing the overall value of the vehicle," adds Prajwal, whose interests include product development, auto styling, product design, 3D modelling and sketching. Our third and final profiled Industrial Design project is Abneet Chauhan's upscale travel luggage for working women, which manages to be ergonomic as well as stylish. Abneet, a Mechanical Engineering student before IDC, is interesting in product styling, CAD rendering, interface design and prototype making. 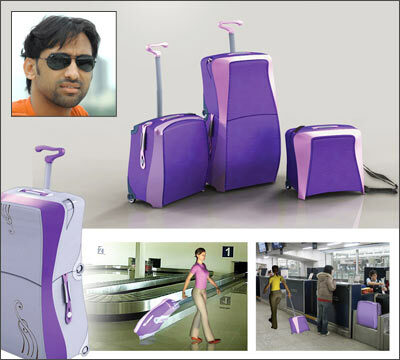 His luggage cleverly splits in two at the touch of a button, making easily manageable separate components. "This hybrid luggage is made of PC plastic and ballistic nylon," he says. "The project was a long journey in exploring form, to achieve feminine characteristics, by redefining the design elements of femininity and taking inspiration from natural entities." 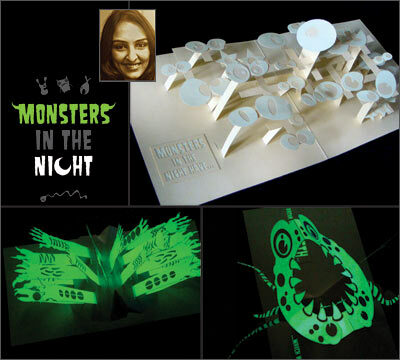 "It took a lot of ideation," says Amrita Pokarna, of her glow-in-the-dark pop-up children's book. Amrita, a Visual Communication student with a background in Arts, whose interests include graphic design, concept art, illustration, animation and typography, says she aimed to create a dynamic, different reading experience. To achieve this, she explored the function of book design as a tool for storytelling. The result? 'Monsters in the Night', a very interesting and unique children's book, which can be read under the covers and with all the lights off! 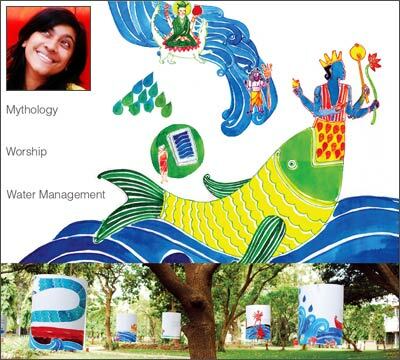 Our second Visual Communication student, Taruja Parande, created an outdoor exhibit called 'Sacred Waters', which aimed to present a different point of view on water sustainability, in a uniquely Indian context, using mythology and other cultural inputs. Taruja, whose background is in Arts and whose interests include design strategy and management and cultural research, says that, "The underlying theme of my project is to portray water as something more than just a resource, by relooking at our traditional, religious and cultural practices with respect to sustainability." Sharbani Ghosh, our final profiled Visual Communication student, who earlier earned her Bachelor of Architecture, has created a memory aid device for geriatric Alzheimer's patients. 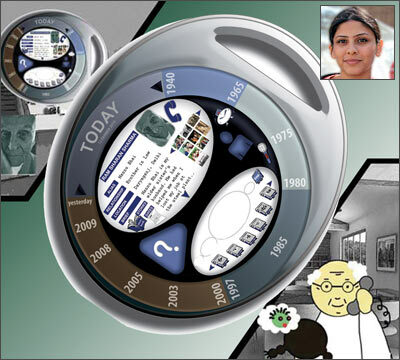 Ghosh, whose interests include interaction design, web-based design, visual design and graphic design, says of the project, "I aimed to design a memory aide for elderly patients suffering from mild and moderate cognitive impairment owing to Alzheimer's disease, also know as age related dementia. The target age group was between 60 and 75. The project attempted to aid their memory in order for them to carry out their daily routine as close to normalcy as possible." In order to understand Alzheimer's and how it affects patients, Sharbani was required to do careful study of afflicted patients and extensive research into the disease. Ketki Saxena, our first profiled Animation student, has given us Gitanjali, a short animation film on Rabindranath Tagore's poem 'Where the mind is without fear'. Saxena, whose interests include storyboarding, character design, web site design and 3D modelling, says Tagore's pre-Independence poem is, "one of the most inspiring poems, where he talks of his views of how the new awakened India should be as a free nation. And to think of it today! It's a big question in front of us." Her film, she says, explores the other side of Tagore's poem, so that one can "make out what are we missing in being a truly free nation." Juny Wilfred, an Animation student who earlier earned his B Tech in Applied Electronics and Instrumentation, gives us Ek Rupaiyah, a short animated film on abandoned children. Wilfred, whose interests include illustration, abstract expressive art, cinematography, storytelling and narratives, to name a few, says of his project: "A beggar girl coming and holding our hand is not new to us. The film is a relook at one such real life incident, juxtaposed against my experience with the kids during the research phase. The technique used was classical 2D cell animation, with colour pencil renderings." Sameer Jena, our final profiled Animation student, gives us one of the exhibition's more personal projects, with Nazar, a short animation film on eyes. Jena, whose interests include animation, film and production design, auto styling, architecture (he has his B.Arch), typography and illustration, says of the film, "It looks at the change in human perception as life takes him to fortune. The film talks on how much success and fortune can affect a person's life, right from his behaviour to his relations with others. The movie is a look at people around us and how life changes around us." Vinay Ahuja, our first profiled Interaction Design student, has created an innovative employment finder for the low income group. 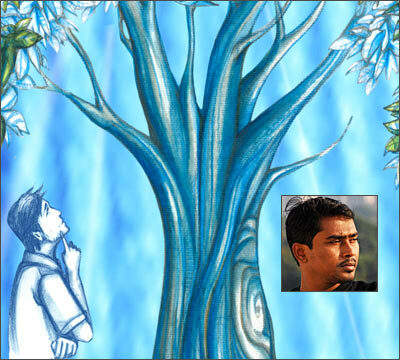 "The project is named after Kalpataru, the wish-fulfilling tree. It's an attempt to understand and solve the problems faced by people like carpenters, plumbers, maids, etc. in finding employment." Ahuja, whose interests include HCI, user experience design, tangible interaction, mobile application and game design, adds that, "The solution given to the problem is by designing an Interactive Voice Response system and a mobile application that can help employers find employees (plumbers, carpenters, etc. ), and in return the employees finds employment." 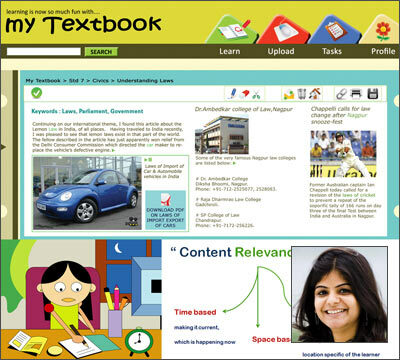 Shreyasi Roy, an Interaction Design student, created a web application called 'My Textbook' which provides alternative learning experiences to children who currently don't have any other learning tools outside of textbooks. Roy, whose interests include HCI, interface design, design strategy, user research, usability and visual design, says that, "The project was an attempt to discover and design a system for education in India that would enable students to use technology. 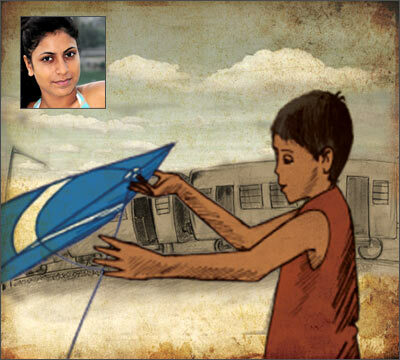 It tried to explore and provide a new source of inspiration to learners, keeping in mind the Indian context. The project was about making the content 'relevant' for the learner." Rasika Madav, our final profiled Interaction Design student, created in two steps a home budget application for mobile phones. Madav, whose interests include design research, web and interface design, usability evaluation and set design, says, "In this project, I observed how people from different cultural and economic backgrounds do home accounting. I designed an application, 'Money planner', which will make money management easy and motivating for today's generation. It can guide the user in planning his budget as per his spending pattern and future expenses, even when he is not taking any extra effort to do accounting." 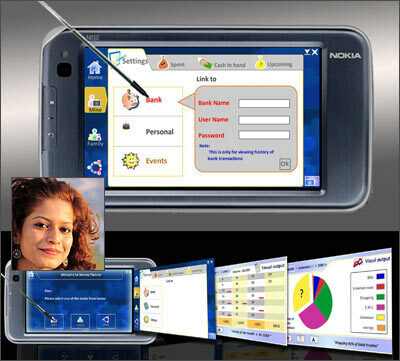 In the second phase of the project, in order to reach her targeted group (the middle class), Madav removed the touch-screen component, and instead made a simplistic User Interface for key-based mobile phones.